Share how appreciative you are with our Thankful for You Collection. Each piece was thoughtfully created with staff and volunteers in mind. Gifts are useful, yet personal, and perfectly capture the spirit of living the Christian faith. Items feature the Bible verse, "I thank my God every time I remember you." Philippians 1:3. Tote features a laminated body with a reinforced bottom and 3-3/4" gusset. 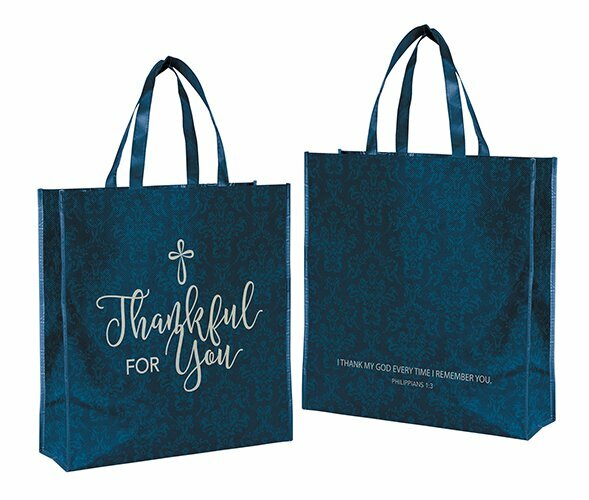 Perfect for shopping trips and carrying books and accessories to Bible study. Thankful for You Collection includes matching items #B3652 - #B3663.